The minister said the management of the national team and the president of the Russian Hockey Federation should have prevented the incident. 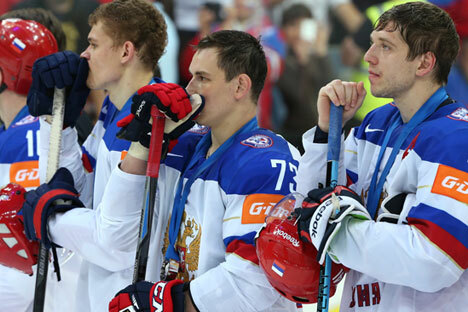 The Russian ice hockey team should not have walked out on Sunday night before the national anthem of Canada was played in honor of the new ice hockey world champions as "the defeat must be accepted with dignity," Russian Sports Minister Vitaly Mutko told TASS on Monday. In the final match of the 2015 Ice Hockey World Championship on Sunday night in the Czech capital of Prague, reigning world champions Russia were crushed 1-6 by the 2010 and 2014 Olympic Champions Canada. "It is hard for me to talk about the reasons for such demarche on the behalf of the majority of the Russian players," Mutko said. "I believe that such questions should be addressed to the management of the Russian national team." Before Rene Fasel, the president of the International Ice Hockey Federation (IIHF), took the final words to declare the winners, to thank Czech Republic as the host and announce the closing of the championship, most of the Russian players retreated to their locker rooms with only a bunch of them remaining on the ice. The incident also took place before the organizers raised the national flags of Canada, Russia and the United States, that were the gold, silver and bronze winners of the championship respectively, and the Canadian anthem was played. "I believe that our hockey players, who left the ice early, did the wrong thing," Mutko said. "The defeat must be accepted with dignity and the winner must be treated with respect. In my opinion, the management of the national team and the president of the Russian Hockey Federation should have prevented the incident." In an interview with TASS, Fasel said he was deeply disappointed, when he witnessed the incident, and it was the first one of such nature over 29 years of ice hockey world championships he attended to. He said it was totally unacceptable what the Russian team did as there could be fights and major brawls on the ice during the matches but never the lack of respect to the opponent in the past-game time. Among the Russian players, who remained on the ice and did not walk away were Alexander Ovechkin, Yevgeny Malkin, Viktor Tikhonov and Dmitry Kulikov. Fasel said he saw how Ovechkin and Malkin tried to stop the rest of the players rushing to the locker rooms and that is why the blame cannot be put on the players. The Russian squad’s head coach and the general manager should have been present on the ice to stop the players from making such disrespectful move, he said. Fasel added that after he returns from the Czech Republic, the IIHF will gather to review the incident and will get in touch with the Russian Hockey Federation on the issue of breaching the IIHF regulations. Leaving aside the walkout of the Russian team, Fasel was satisfied with this year’s championship, held in the Czech cities of Ostrava and Prague between May 1 and 17. The 2010 and 2014 Olympic Champions Canada were hungry for the world champion’s title, which they last held in 2007, and barraged into the final match against the reigning world champions Russia in a crushing winning spree boasting a record of 60-15 (goals scored and goals missed). The final match at the O2 Arena in Prague between the long-time rivals Canada in Russia opened with a very emotionally tight period as both teams tested each other on the level of skills and nerves. The Canadians, however, were more active in Russia’s zone and it eventually earned them 1-0 advantage over the reigning world champs as Cody Eakin put the puck into the net behind Russian goalkeeper Sergei Bobrovsky with less than two minutes remaining in the opening period. It was the middle period, when the Canadians increased their advantage to 4-0 by scoring three more goals as they peppered Bobrovsky with shots, while the Russians attempted only one shot at Canadian goalkeeper Mike Smith throughout the period’s 20 minutes. Assisted by Cody Eakin, Canada’s forward Tyler Ennis cannoned the puck into the Russian net less than two minutes into the second period. Five minutes later Crosby scored another goal against the Red Machine and almost 50 seconds later Tyler Seguin’s fired puck found its way once again past Bobrovsky. As the teams resumed the game in the third period, it was Crosby in the right place again to assist Claude Giroux, who scored the fifth goal for the Maple Leafs on the 49th minute of the match. Less than a minute later, his teammate Nathan Mackinnon cemented the lead over the Russians notching up the score to 6-0. Canada’s defense in the knock-out stage of this championship was spotless as the team never missed a goal creaming Belarus 9-0 in the quarterfinals and hosts Czech Republic 2-0 in the semifinals. The Russian team, however, blocked the Canadian’s shootout streak scoring a goal with seven minutes remaining in the match after forward Sergei Mozyakin fired a wrist shot and his puck ricocheted from Yevgeny Malkin’s skate between Smith’s knee-pads into the net. On the whole, the Canadians weighty 6-1 win is also proved by the statistics, which shows that the reigning Olympic champions outshot the Russian squad in the final match by the whopping 37-12 margin. The matches of the 2016 IIHF World Championship will be held in Russia’s capital of Moscow and in the country’s second largest city of St. Petersburg between May 6 and 22.